“Although the number of monarch butterflies overwintering in Mexico has rebounded considerably, turning this encouraging one-year population response into a consistent long-term trend depends on advancing conservation efforts that are critical to help monarchs survive and reproduce in Iowa and the Upper Midwest,” said Steve Bradbury, professor of natural resource ecology and management at Iowa State University. Monarch butterflies face many challenges including the loss of milkweed and nectar plant habitat in its spring and summer breeding ranges. Female monarchs lay eggs exclusively on milkweed plants. National and state efforts focus on establishment of new milkweed habitat to reach conservation goals. "This year's high watermark is very encouraging, and Iowa has a critical role to play in providing summer breeding habitat for the monarch for years to come," said Bruce Trautman, acting director of the Iowa Department of Natural Resources. "We have a really strong group with broad expertise working together to support the monarch recovery in Iowa and beyond." Habitat plantings include milkweed and a diverse array of blooming species to provide nectar for adult monarchs throughout their life cycle and seasonal migrations. The current Iowa Monarch Conservation Strategy seeks to establish approximately 480,000 to 830,000 acres of monarch habitat by 2038. Iowa’s strategy, combined with those of neighboring states, is designed to consistently maintain a yearly population of 225 million adult monarchs, or about 15 acres of occupied forest canopy. "The monarch butterfly population numbers are encouraging and serve as a reminder of the importance and impact of our ongoing conservation efforts," said Mike Naig, Iowa Secretary of Agriculture. "Iowa's long-term strategy includes expanding habitat for monarchs on our agricultural land, urban areas, roadsides and other public land." The Iowa consortium is a group of 50 organizations, including agricultural and conservation associations, agribusiness and utility companies, universities and county, state and federal agencies. Roughly 40 percent of all monarch butterflies that overwinter in Mexico are estimated to come from Iowa and neighboring Midwestern states. Expanding monarch habitat in Iowa will play a major role in the recovery of the species. The Iowa strategy — developed by consortium members — guides the implementation and documentation of voluntary, statewide conservation efforts based on the best available science. 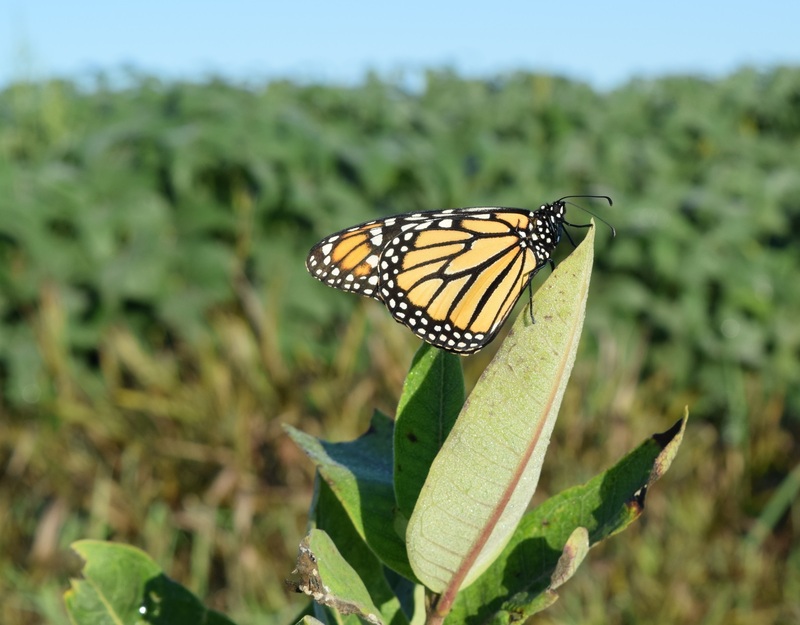 Their approach fosters habitat improvements in rural landscapes that do not conflict with agricultural production, are sufficient in scale to support improved monarch breeding success and strive to complement other conservation programs. Monarch on common milkweed plant. Photo by Iowa Monarch Conservation Consortium.